Well, as you may have already noticed, I am a huge advocate of dating your spouse...whether you are newlyweds or have 30 years of marriage behind you. Being married should never be a reason to stop dating...that's when the fun begins! Here are some excellent posts from fellow bloggers about dating. Check them out! To help you with your date nights, I have put together a list of ways that you and your spouse can rotate the date planning, so it doesn't always fall on just one of you. 1. Have some sort of “item” that you can pass back and forth. Whoever has “it” is in charge of planning the date that week. 4. This isn't really a rotation, but it makes dating easier! Keep a Date Night Guide: Get a medium sized binder, pocket dividers, blank tab dividers, and some sheet protectors. On the blank tab dividers, write your categories (i.e. Dining Out, Take Out & Delivery, Movies & Theaters, Parks & Recreation, Nightlife, Hotels & B&B's, Shopping, Seasonal, Babysitter Info, etc.) Keep menus and brochures in the sheet protectors. Keep a "try it list" in each category, so you don't do the same thing over and over again. My husband and I have had several versions of this throughout our marriage, but this is our latest rendition. 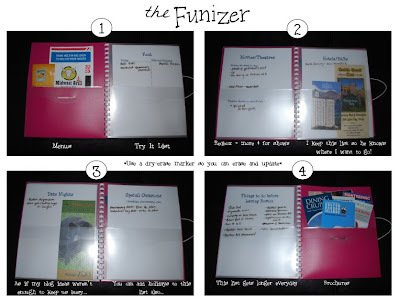 I call it the "funizer" (fun+organizer=funizer). So, when I find some new cool thing I want to try on an upcoming date, I "funize it" so I won't forget. So, there you have it. This Date Night discussion is by no means over....you know I have more to say, but I'll leave it for another day! What's your best piece of "wisdom" concerning date night? What great ideas. I am subscribing to your blog. My husband and I have been together since high school. I love going on dates with him. SUCH a great idea, we keep a list of things we want to do on our fridge, restaurants we want to try, etc and then when we are bored "What should we do?" we check the list out! Love this one!! Great idea! Okay, I LOVE this blog! What a great idea. I especially love the "Funizer" idea! That is so smart and a great way to remember to try things that you have been wanting to do! I am impressed. Just to keep it fresh. We are having a painting date this week. Wine, paint and conversation! That organizer is SO totally up my alley!! P.S. - I posted an award for you on my blog! I needed this blog. Having no kids, we are lax about dating eachother. This week was our one year anniversary and we did a big time date and it really put us back in an "in love" state of mind. I love the idea of keeping track of ideas, because we are not big planners but there are so many things we talk about wanting to try. This would be a good way to have something available when the mood strikes. Your blog is awesome. I love how your make our marriages better!!!! I'm gonna buy that notebook tomorrow at the ol Walmart. Love it!! I'm such a firm believer in weekly date night. It does wonders for a marriage. Thanks for such a fabulous blog!!! Another great idea! What kinds of things do you have on your "Try it" list?